For our Super Bowl menu, we had Maryland vs. San Francisco food, and our desserts featured an east vs. west chocolate cookie showdown. 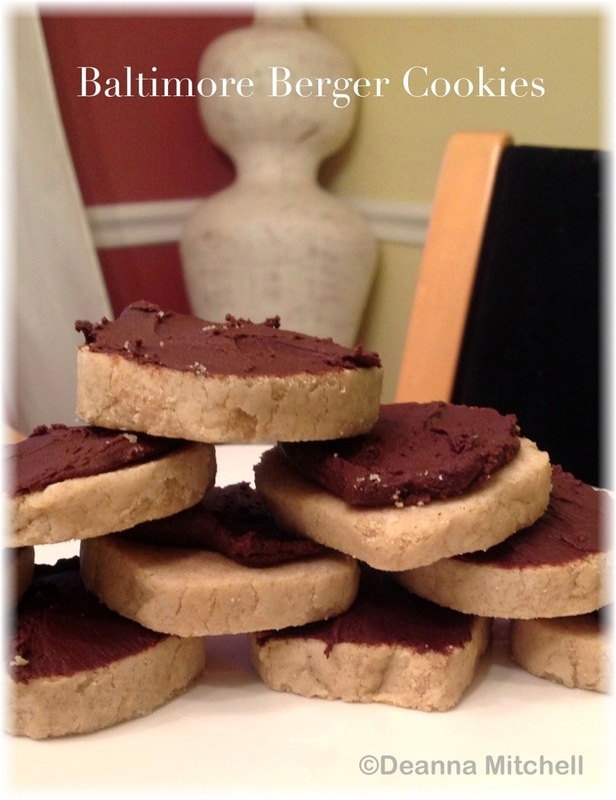 Here is my whole wheat recipe for Baltimore Berger cookies. As far as I can tell, these were originally made by one bakery and gained wider popularity in the city. Today, they seem to be less popular and reviews online were mixed. Still, the combination of a shortbread cookie and chocolate frosting sounded pretty good, so we forged ahead with our own version. These don’t look fancy, but they are very rich and super tasty. We used locally milled, whole wheat pastry flour and organic sugar for these little bad boys. The shortbread is rich and buttery (as shortbread should be) with a nice bit of nuttiness in the wheat flour. With only four ingredients, these are easy to make and would be a great family baking recipe! In the bowl of a standing mixer, combine butter and sugar. Beat on high speed for about 4 minutes, until well blended. With mixer on low, add flour 1/4 cup at a time until dough is well blended. Remove dough from bowl and shape into a log about 12″ long and 2″ wide. Wrap in plastic wrap and put in the refrigerator for about 3 hours. Remove dough roll from the refrigerator and cut into 24 equal slices. Place cookie slices on the lined baking sheet about 1″ apart. Bake for 45-50 minutes. Cookies should not brown, but they should be dry and firm. Let cool for 15 minutes on the baking sheet. Melt chocolate in a microwave safe bowl in 1 minute increments, stirring between and stopping when chocolate is smooth. Spread about 1 tablespoon chocolate on each cookie and let set. Ohhh girl I love shortbread cookies! I think I’ll make these! If you add a little heavy cream to the chocolate chips when you melt them it keeps the chocolate smooth & creamy – a little bit easier to work with. I think these should be decorated for Valentine’s Day!!! Loving the whole wheat substitution. Thanks! I’ll try the cream next time! I brought the leftover cookies to work and everyone loved them, so they are a “do again” for sure!